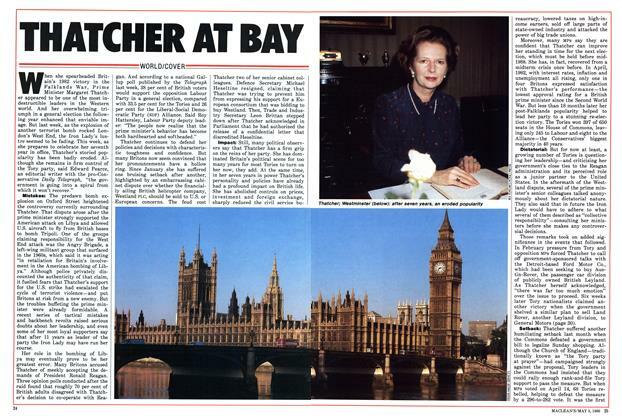 When she spearheaded Britain’s 1982 victory in the Falklands War, Prime Minister Margaret Thatcher appeared to be one of the most indestructible leaders in the Western world. And her overwhelming triumph in a general election the following year enhanced that enviable image. 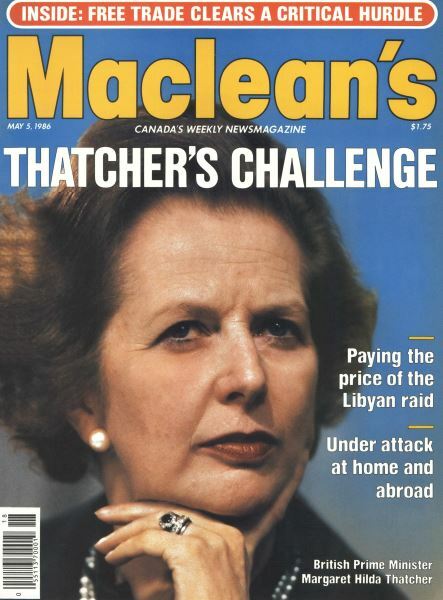 Maclean’s Business Editor Patricia Best went to Britain to examine the most ambitious of Margaret Thatcher’s attempts to change the face of modern Britain—her controversial plan to remodel the economy and industry. 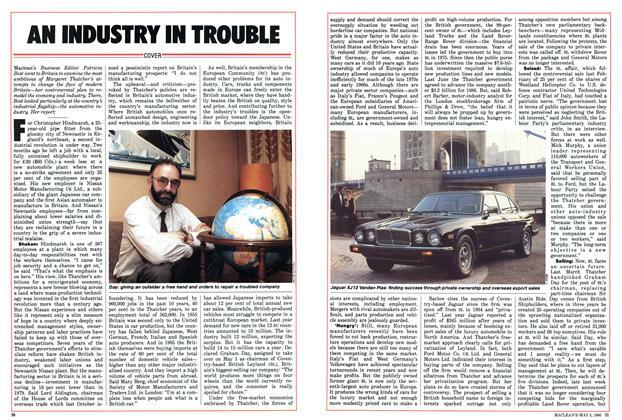 There, Best looked particularly at the country ’s industrial flagship—the automotive industry. The smile said it all. When chairman Robert Packwood entered the crowded Senate Finance Committee room for the second time last Wednesday, it was clear that a deal had finally been struck. 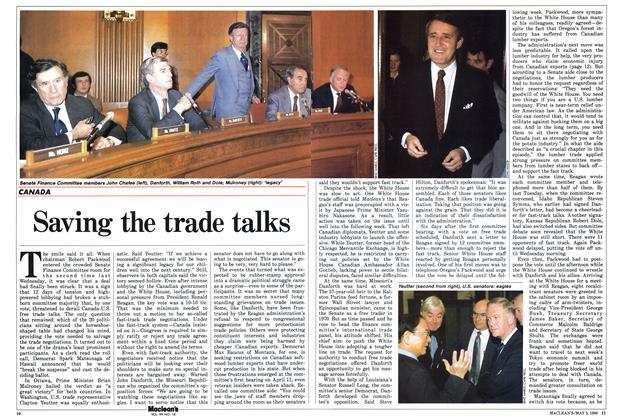 It was a sign that 12 days of tension and high-powered lobbying had broken a stubborn committee majority that, by one vote, threatened to derail Canada-U.S. free trade talks. The speculation was part of the aftershock of violence and political protest over the April 15 U.S. air strike against Libya. Last week a growing number of analysts said that the American bombing raid may have led to a severe curtailment of the once-unchallenged domestic power of Libyan leader Col. The four-storey building in a drab northern Tokyo suburb is vividly conspicuous. Painted bright red, it has barred windows, a rooftop lookout tower and a massive front door made of steel plate. Across the street, plainclothes police permanently watch the headquarters of Japan’s far-left Middle Core Faction, whose leaders are openly dedicated to what one spokesman described as “blowing up” next week’s summit meeting of the leaders of the Western world’s top seven industrialized nations. Ever since John Crosbie lost the race for the Conservative leadership to Brian Mulroney at the 1983 Tory leadership convention, observers have watched—in vain—for symptoms of disloyalty. Although the witty Newfoundland MP has been outspoken on a variety of issues which have embarrassed the Government—such as his criticism of the handling by the Prime Minister's Office of the Tunagate scandal—critics have been impressed by Crosbie's legislative record.